Back during the campaign days in the summer of 2016, Trump accused Clinton of being crooked because the FBI was investigating her use of email, in particular as it related to classified information being stored on a private server. Trump then said Clinton was not eligible to be president because she was under investigation. Now Trump found out that the FBI, approximately at the same time, was investigating people in his own campaign for what appeared to be improper connections with a foreign adversary. For that he calls the FBI crooked. In tweets he blames the FBI and Obama for not coming to him and letting him know. First, should the FBI, an agency charged with protecting the American people from criminal activity really go to every suspect and warn him that he might be under investigation? At the time, Trump was one of many candidates. He just had some bad apples in his campaign, many of which have meanwhile plead guilty. There was smoke, and now we have proof that there was fire. Second, what’s the bigger potential crime? Being careless with classified email or purposely colluding with a foreign adversary to subvert the American election system? Regardless of the size of the crime, the FBI did its job properly, investigating both leads. Third, the FBI, charged with protecting the American people, did exactly what its mission is: to investigate suspicious activity. Trump’s people, his children, his employees, and possibly himself, conducted what now looks like illegal activity. Rather than dealing with the cause of why the FBI was checking into his campaign at the time, he distracts us and points to the FBI as being crooked and conducting illegal activity. I only see deliberate deception by Trump. 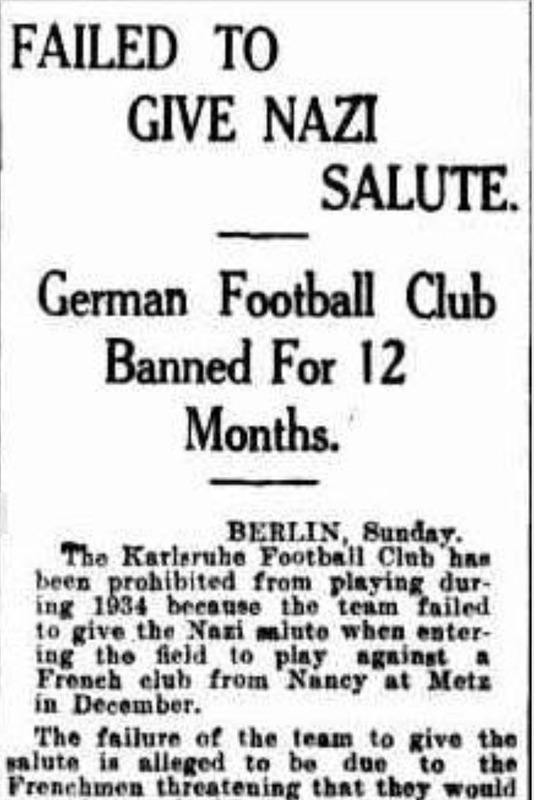 In 1934, the leadership of Germany made sure that every sports team exercised the salute of the dominant political party. Not doing the salute was considered unpatriotic, and as time progressed, it had more and more serious repercussions. Today members of American NFS teams are using their spotlighted status in society to protest injustice perpetrated on American citizens based on the color of their skin. See the video below as an example, where a young black man is dragged out of his own car, in his own driveway, because he has a broken tail light. Good grief! Seriously? We are concerned about a piece of music? A flag? A ceremony? One group of society, in this case the leadership of the government, decides it attaches some meaning to a ceremony, and then harasses citizens when they use their right to protest an injustice, and claims they are disrespecting the country. The logic just does not work. This is the same logic that Christians usurped in medieval times against people who didn’t buy into their religion – heretics. It is the same logic many contemporary religions still use today in many places of the world to cast out, or chastise and punish those that do not accept that religion. Examples are radical Islamic factions in a number of countries and fundamental Mormons in the United States, and there are many others. The video below shows police injustice, and humiliation of private citizens, which is the very thing the NFL members are protesting, the very occurrences our leadership should be working on to eliminate. How do they expect us to treat them with any respect? Trump killed the publishing of tax returns by presidential (and other) candidates. I predict that no candidate will ever again publish his or her tax return. I certainly would not, were I to run for office. We are the ones that disrupted Mnuchin at UCLA. The only way to stop fascism is by actions of people demanding the Trump/Pence Regime Must Go! I don’t know if you all remember, but Mnuchin was one of the raiders that personally benefited from the real estate crash of 2007 that wiped out the savings and homes of millions of Americans. What leadership we have! What in the world happened to Paul Ryan? He used to be smart, principled, thoughtful and gracious. 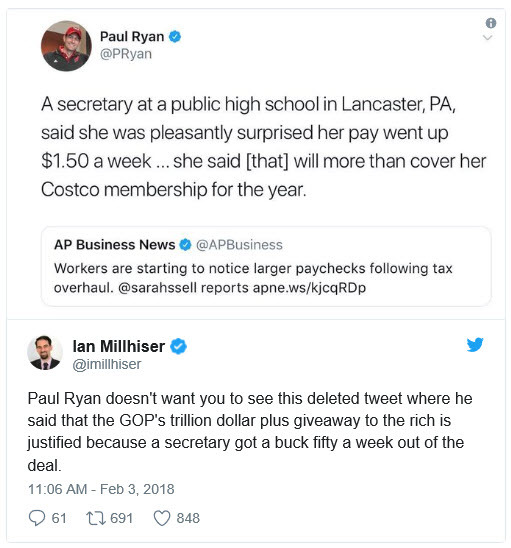 Ryan was ridiculed after his tweet which made it sound like a $1.50 a week increase in a secretary’s paycheck was good news! Oh, yes, her Costco membership for a year is now covered! He later deleted that tweet. I thought I’d keep it alive here. — Eric Trump, complaining on Fox News that Democrats didn’t stand when Trump said we were united on God. Sorry, Eric, but just because you believe in a sky fairy does not mean I have to stand and applaud it when it’s mentioned, particularly in a governmental setting in a country that should have state and church separated. What is great about America is exactly that – my right to sit when you blather about something that is completely meaningless to me. 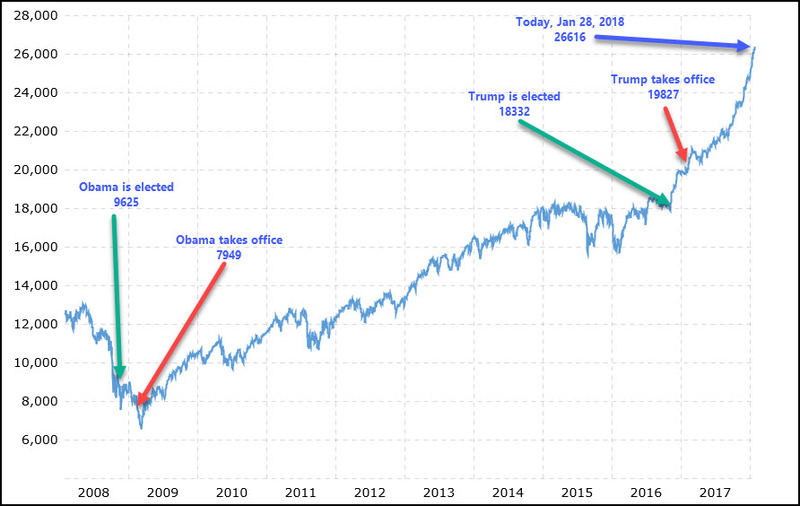 My post titled Stock Market under Obama and Trump of June 2017 attracted a number of comments from an anonymous reader. While I usually don’t respond to posts by readers who do not identify themselves with a name (Hopeyouarentafinancialadvisor), this one had enough substance that I not only thought it warranted responses, but further research and discussion here. 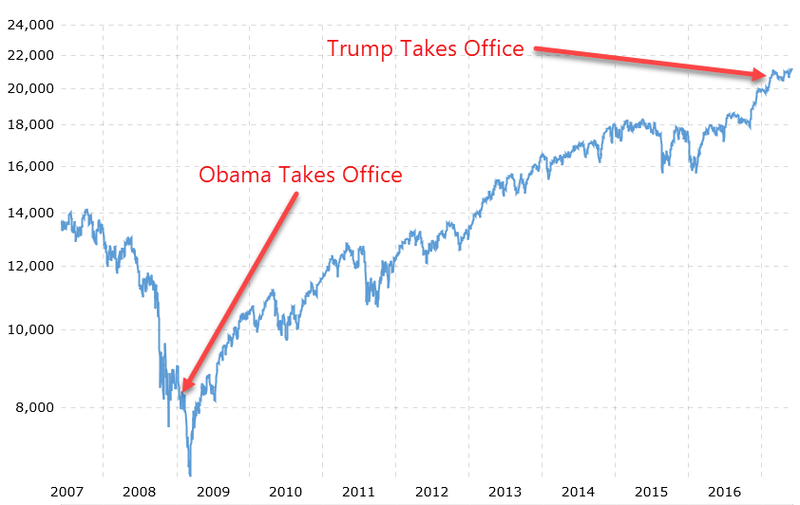 My argument in June was that, yes, during Trump, the economy, as measured by stock market value increases, has been booming, but I wanted to bring back some credit to Obama, where that boom actually had started back in 2009. I used this chart to illustrate that point. My point of the original post was that Trump could not alone take credit for a rising stock market. The stock market had been rising since 2009 at a steady clip, without major dips that we experienced in the Bush years. My point also was that Obama entered during freefall, whether you look at his date of election or inauguration. Yes, if you look at the election dates, due to the timing of the Bush freefall, and subtract the two, the election date difference is smaller than the inauguration date difference. And yes, looking at the graph 6 months later, one year into the Trump administration, it is visible that there is an inflection point at Trump’s entry and the curve has increased to a steeper slope, particularly in the last six months. I give credit to Trump’s approach of opening regulation and pro-business general policies. Here is another view that shows that Obama’s gain during his first year in office was larger than that of Trump. I know Hopeyouarentafinancialadvisor will argue that this should have been done using election dates rather than inauguration dates, and the numbers would be smaller. However, skewed smaller, because since Obama took over during a freefall, we certainly can’t penalize him from the continued drop before things, thankfully, got caught on the bottom. So I reassert – given the economic conditions of where Obama started – in a mess – he did alright. I wish it had grown faster, too. Trump keeps saying he took over a mess. He did not. He took over when things were going quite well, and had been going upward steadily for 8 years. That’s not a mess, even if Hopeyouarentafinancialadvisor might argue that it could have been better. The real numbers, of course, will be those of the next few years under Trump. Will this trend continue? What will a full four or eight years show? The Shutdown – Whose Fault Is It? The Republicans must be crazy. The Republicans control the House, the Senate and the White House. They have now done so for exactly a year. They knew this day would come. And they could not prevent a shutdown? 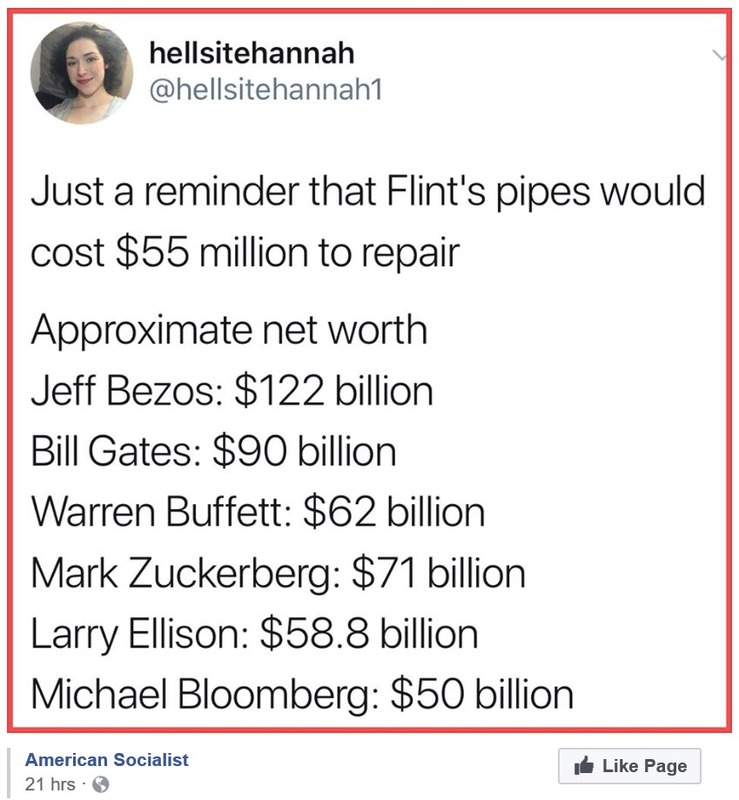 And they actually blame the Democrats??? If the president had any kind of leadership skills, if he had engaged himself in the effort and lobbied in Congress and the Senate for votes, if he had put forth a plan and an agenda, this could have easily been done. But the president is lazy and inept. Here is a worthwhile post from a conservative blogger I follow. There are some things I appreciate about Trump — did I really just say that? — but this is one of them. We need to stop sending American money by the container-load overseas, where it provides fodder for corruption, and where it creates its own subculture of dependencies. Read the Chiefio’s post and marvel for yourself! $Billion to Palestine? For what? Dear Mr. Trump: Just stop sending our money to people who hate us. Please.